The corrosion inspection of pipes and similar objects is based on the evaluation of shadow projections. The wall thickness can be determined from the distance of the projected outer and inner surface of the pipe wall, corrected by the magnification factor due to the central projection. Visual evaluation uncertainties and the geometrical unsharpness of the edge projection can result in considerable measurement errors. The numerical analysis of digital profiles across the pipe image enhances the accuracy of the wall thickness measurements. The digital data can be obtained from digitized radiographic films, imaging plates (Computed Radiography) or flat panel detectors. The automated detection of the outer and inner wall surface of the pipe is done usually by edge detection and filter algorithms of the profile line at the position under investigation. The wall thickness estimation in tangential projection technique is based on the evaluation of profile plots along the pipe diameter as shown in fig.1. For practical reasons (wall thickness range, mobile application) Iridium 192 is used mostly as radiation source. Fig 1: Geometrical magnification effect inherent to the tangential exposure technique. Fig 2: User interface for automated wall thickness measurement in tangential projection technique. Fig.2 shows an example for the developed user interface. The user draws the profile plot interactively with the mouse across the wall of the pipe. 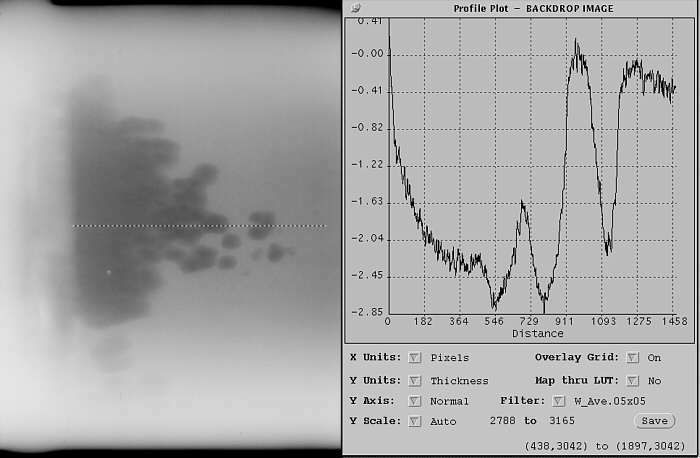 The computer returns the calculated wall thickness according to our specially designed edge detection algorithm and marks the detected edge positions of the profile in the image (ticks perpendicular to the profile indication). Depending on the look up table, which is used to display the image on the monitor, the position of these ticks can be appear at "wrong" positions in the displayed image for the visual evaluation. Therefore, it is very important to detect the edges of the profile on the original data set, which has a gray value resolution of 12 to 16 bits (depending on the AD converter implemented). The accuracy of the presented method was verified using test pipes with various diameters and wall thicknesses. The wall thickness could be determined within an accuracy of better than 0.2 mm. A newly developed algorithm, derived from Computed Tomography, enhances the accuracy and stability of this technique . Fig 3: Profile plot across a radiograph of a step wedge (13 to 27 mm thickness), linearization of gray values by LUT according to eq. (5) at 160 kV. Fig 4: Radiograph with corrosion inside a pipe (diameter 100 mm, wall thickness 6.3 mm), done in projection technique at 160 kV (double wall penetration), profile plot with calibrated wall thickness loss (right). 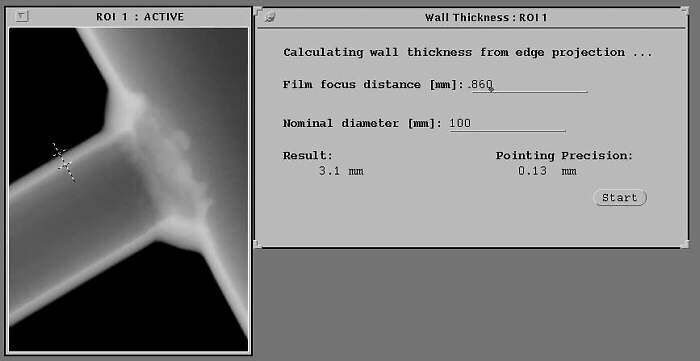 There are many practical applications where no known wall thickness changes can be obtained from the radiographic film under consideration because the operator did not know that such a feature is important for the evaluation. Our investigation shows that in this case meff can be determined also from a step wedge exposure with the same film system class, the same radiation energy and the same nominal wall thickness. The achievable accuracy with a step wedge exposure is shown in fig. 3. The influence of the scattered radiation modifies the slope of each step, but the mean values of the steps follow the absorption law. Practical testing of the presented algorithm was performed for corrosion monitoring of a pipe system in a power plant. In fig. 4 local corrosion by erosion is shown in a pipe with a inner diameter of 100 mm behind a weld. In this case only the nominal wall thickness of the pipe is known (6.3 mm). To calibrate the obtained density changes into wall thickness changes a step wedge exposure with a nominal wall thickness of 13 mm (double wall penetration in the pipe exposure) and the same source/film system combination was used. From this a meff = 1.30 1/cm could be determined which is used for the wall thickness calculation of the pipe according to equation (5). The minimum wall thickness, found with a manual ultrasonic wall thickness, meter was 4.0 mm (»2.3 mm wall thickness loss). This is in good agreement with the measured wall thickness loss by radiography, which shows even a higher loss of up to 2.8 mm for small spots. The accuracy of these measurements is about 0.2 mm.